HOUSTON—Noting his quiet demeanor and the fact that he has not been included in any of the conversations taking place around him, sources at Murphy’s Tavern and Grill confirmed Sunday with increasing certainty that a Cleveland Browns fan has shown up to the sports bar by himself. The man—estimated to be in his late 20s or early 30s—has reportedly been standing silently between several groups of people he does not appear to be acquainted with in any way, and has seemingly not been looking around in an attempt to locate friends, relatives, or coworkers among the roughly 200 other patrons at Murphy’s, fueling speculation that he in fact purposefully and willingly came to the establishment alone. Sources also confirmed that the man is the only person in the entire bar wearing a Browns jersey. According to witnesses, aside from briefly waiting to order a beer after initially arriving, the man has otherwise spent virtually all his time with his drink in hand while staring intently at the only television in the entire bar showing the Browns game. Whenever the game has gone to commercial, he has reportedly either turned to the Texans game being viewed by the majority of the bar’s patronage or simply looked down and browsed his phone. Several early reports indicated that at one point, after Cleveland’s defense made a key stop on third down, the man shouted, “Yeah! There we go!” and clapped several times, which drew the attention of several neighboring patrons who looked around in confusion before realizing that he was talking to no one in particular. 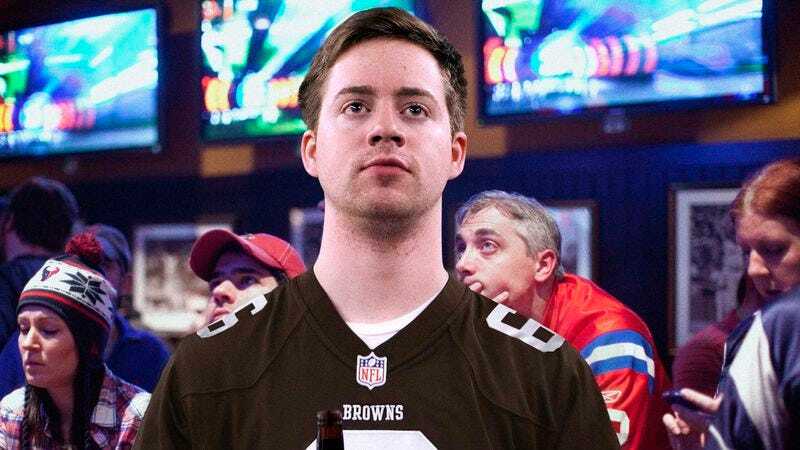 While evidence continues mounting that the Browns fan has come to the bar by himself, the reasons behind why he has apparently chosen to do so are reportedly still unclear. Sources confirmed that at halftime, when everyone else in Murphy’s was busy eating bar food and engaging in friendly discussions about football, the Browns fan reportedly went to the bathroom and then, upon returning to the same spot where he was previously standing, watched the entire CBS halftime show with no volume. Witnesses confirmed that he did attempt to converse with one other person midway through the third quarter, when, while ordering his second Blue Moon, he jokingly remarked to a bartender that Houston would be better off with J.J. Watt at quarterback instead of Ryan Mallett. The man was also said to have largely ignored several nearby bar-goers who loudly cheered and exchanged high-fives around him while celebrating a Texans touchdown. At press time, after the Browns game had concluded, the man finished the last of his beer, placed his empty glass on the bar, and quietly walked out the door.